Scientists using NASA’s Chandra X-ray Observatory have discovered the first sign of emitted X-rays from our favorite dwarf planet, Pluto! This detection offers new insight into the space environment surrounding Pluto—as it is the largest and most well known object in the outermost region of the solar system. This finding of emitted X-rays is somewhat surprising given that Pluto – unlike Earth and other celestial bodies in our solar system—does not have a magnetic field, and is very far away from the Sun. These two factors strongly suggest that X-ray emission is near impossible. Up until this discovery, the most distant solar system body with detected X-ray emission was Saturn’s rings and disk. However, the constant streams of charged solar wind particles from the sun could create X-rays when interacting with gas surrounding planetary bodies. 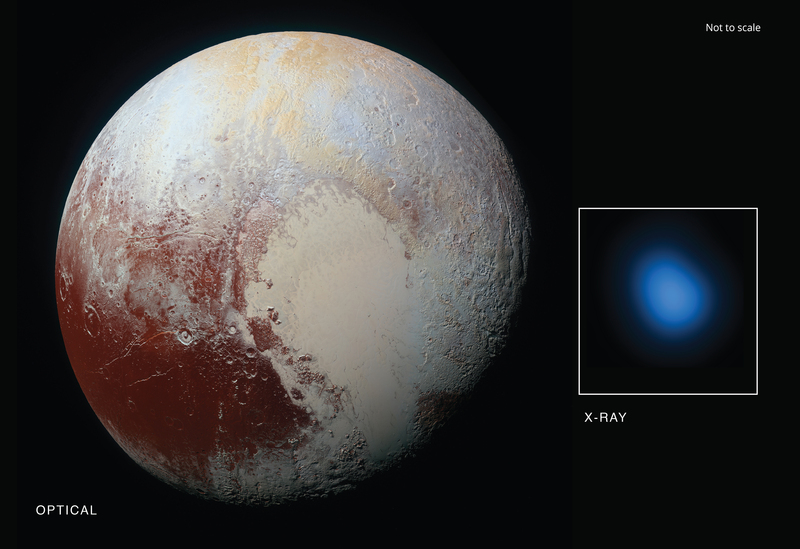 The strange thing is that Pluto is producing far more X-rays than a body with only gas surrounding it should, at such a far distance from the Sun. There is much more to uncover and figure out with this recent discovery. Further research will help us to expose what exactly is behind the dwarf planet’s rather bright X-ray glow.